Against a backdrop of lengthening food queues, Esmail Ahmadi-Moghaddam, the head of Iran’s law enforcement forces, has warned that films depicting scenes of chicken dinners could provoke the underprivileged classes to attack the rich. Yet I am puzzled about the story. Nothing about why the prices have increase so much on newsletters about Poultry raising. Nothing on Poultry news…nothing on the Poultry Site either. But the UK Telegraph notes that the price of consumer goods and food are soaring in that country. It is the latest in a catalogue of embargoes that have gradually underminedÂ Â the Iranian economy and eroded once relatively affluent living standards…Unemployment in Iran’s industrial heartland has soared to an unofficially estimated 35% because factories unable to import vital goods and equipment due to sanctions are forced in turn to sack their workers. So where do the chickens come in? A lot of the problem is because the West, trying”non violent” means to stop Iran from getting a nuclear bomb, has again imposed sanctions…and the latest bunch of sanctions are starting to hurt: not the government officials, who are crooked enough to make sure they make money off of the sanctions, but the common people. (Italics mine). Yes, corruption is always part of the story, but rarely mentioned in the western media, who have little experience with it. The dirty little secret of Iran is that the hope was having a theocracy would stop corruption; instead, it only made the theocrats and their families rich. Â The religious dictatorship that has run the country for three decades, long ago lost the loyalty of most Iranians. The corruption, brutality, and hypocrisy of the government has been matched by brutality and the loyalty of a quarter of the population that, for religious reasons, backs the clerics. Officially, the sanctions are meant to persuade the Iranian government to halt their nuclear weapons program. Unofficially, the sanctions will only do that if enough Iranians get angry enough to rebel, or convince the government that the long anticipated rebellion is about to happen. No sign of that yet. But the food problem is not only going to hit Iran (although it is in the crosshairs of the West). Another headline you might have missed: There is a major drought in the US, so presumably the prices of corn will go up. Indeed, the prices are already going up, so someone has started speculating, and the increase in corn prices won’t only be a problem in Iran. Iran need to go through the government to stop “ban forward trading in the commodity.”…. Yup. Someone’s making a fortune in all of this, but it is the common folks who will suffer, along with the small farmers and business owners who are trying to keep their chicken farms and restaurants afloat. A small note here to update you on chicken farms. Although a lot of folks think that chickens in poor countries come from nice “free range” chickens running around a farm being fed by the farmer’s wife, that is not true.”Free range” chickens get eaten by hawks, dogs, cats, and sometimes hide their eggs so you can’t eat them (and this doesn’t include the danger that the free range chickens can catch diseases from other birds, such as bird flu from migrating birds). But a couple chickensÂ in a farmyard will feed a small family in an isolated rural African village: but where do you get cheap protein for the workers in the huge Megacities of Asia and Africa? The answer is chicken farming, for both eggs and broiler chickens.Poultry news has a nice article (albeit a bit old: 2010) on the dynamics of chicken farming in the world. No, it’s no longer a US monopoly on cheap chickens being dumped into poor countries. The main center of chicken farming is now China and SE Asia. 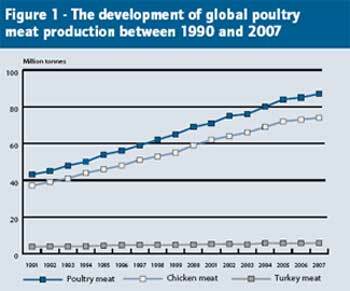 The dominating position of Asia in global poultry meat production is mainly due to the dynamic development in China, India, Iran and Indonesia. Something to remember the next time you read about obesity in Asia as a growing problem. You don’t need a famine per se to make people hungry: All you need to do is raise the price of food too high for the average worker and his family. And an increase in feed prices will have a ripple effect on not just farmers and grocers but on the industries that supply them, and the workers who are laid off. So although the price of oil gets all the headlines in the American papers, the real story is the price of food, and it’s ripple effect on the economy. What the US is doing to Iran is nasty, but could be justified as less murderous than war. But when the prices of food go up due to speculation, well, let’s just say I hope those behind it end up in the lowest circle of hell. Yet Iran is not the only country that is in today’s news. Did you wonder what Hillary was saying when she “made nice” with the radical Islamacist president of Egypt? She added that the U.S. would forgive $1 billion in Egyptian debt and provide $280 million for economic development. Spengler’s essay was from May, and he estimated Egypt would go broke by September, but Hillary’s “gift” might set that date back a little. Despite all the talk of famine, the dirty little secret is that things have been improving over the last 30 years, and true famines are rare. The increase in food prices by Iran will probably not result in starvation, and although the Mullahs would like the bomb to push around their hated Sunni Arab neighbors, one really doubts they would nuke Israel, for fear of being nuked back. So the real food crisis might not be in Iran but in Egypt, and the greatest threat of war could be if their president was tempted to push Israel a bit too far and end up with another war, and end up with riots, food shortages, and starvation in Egypt. And Israel? Well, did you hear that they just found a huge gas field off their coast? That, and Fracking in North Dakota is changing the ability of the Middle East dictators to threaten the west as they did under Jimmy Carter. Something to think about the next time you read a newspaper full of propaganda. Things aren’t as simple as they seem. * In 1981, the Liberian president was overthrown by one “Sargent Doe”, who had little education. An American sent to advise him tried to explain why he couldn’t do X, but was getting no where. He finally told him: You do X and Liberia go kaput. I do not mean that the present President of Egypt is ill educated: He is an engineer with a PhD. (I was making a joke)Â but I am not so confident he won’t be influence by the more extreme in his party. I suspect a lot of things were discussed that won’t hit the newspapers (unless Wikileaks finds it and puts it on the piratebay for us to read). Nancy Reyes is a retired physician living in the rural Philippines. She worked in Liberia in 1980. No user commented in " Iran’s Chicken problem: It’s the Food Stupid "